In other news, The Playlist sat down with director William Friedkin ("The Exorcist") who had some kind words for PTA when discussing which films he's currently excited about. There's nothing out there that interests you? Very few things. I'll definitely want to see Paul Thomas Anderson's film called "The Master," and whatever the Coen Brothers do I'd probably be interested in. Not too many others. Stay tuned. We should have a very helpful/informative post in the near future. FYI, we're a lot more active on Twitter than Facebook so if you like your news up-to-the-moment, that's where you want to be. Is it the exact same camera that was used to film 2001 space odyssey or just the same type/model? In the trailer you can easily tell which parts are 65mm and which are 35mm.... I wish it was all in 65mm. Any reason as to why the movie is not full 65mm? Which parts from the trailer are in 35mm? I'm not sure I can pick out all the shots that are 35...but I could definitely pick out which ones are 65. The photo portrait scene with the young kids is the most obviously example of 65. Nice work Justin. 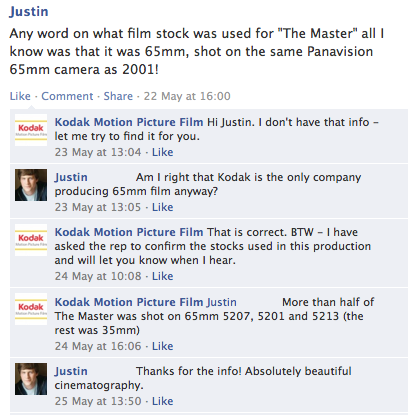 And thanks to the Kodak Social Media Czar for tracking down the details.